The Kirtland's warbler continues to increase in numbers and expand its range as a result of habitat management, and the tiny song bird has found another new home on private land northeast of Grayling in Crawford County. At least four nesting pairs have used a 300-acre habitat along the AuSable River, owned by Trout Unlimited, for the past two years. The Habitat Foundation and Trout Unlimited restored habitat there through a 1994 project that marked the first major effort to manage private lands for endangered species. 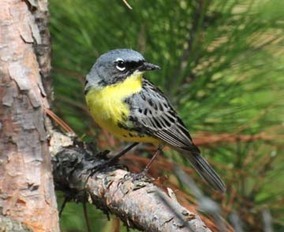 Except for a few in the Upper Peninsula and Wisconsin, the world's entire population of the Kirtland's warbler nests on jack pine plains in the northeast Lower Peninsula. In most years, more than 80 percent of breeding pairs are found in just three counties - Oscoda, Ogemaw, and Crawford. Researchers began counting singing males in 1951 and have recorded fairly steady increases since a low of 167 in 1987. The Kirtland's warbler is a small, blue-gray and yellow, sparrow-sized bird which usually nests on the ground on well-drained sand under stands of jack pines between fine and 20 feet high, with branches that extend to the ground. Historically, these stands of jack pine were maintained by naturally occurring wild-fires that frequently swept through large areas of Northern Michigan. Fire suppression programs altered this natural process, reducing the Kirtland's warbler habitat. The warbler also suffered because of the expansion of the brown-headed cowbird, a prairie species, into the north country when loggers cleared the forests. The Kirtland's warbler has evolved no defense against the newcomer, which lays its eggs in the warbler's nest. The quicker-hatching and larger cowbird chicks are fed by the unwitting warbler at the expense of its own offspring. This nest parasitism is a major cause of reproductive failure in the Kirtland's warbler. For decades, wildlife biologists and foresters have used a combination of clear-cutting, controlled burning, and replanting to mimic the effects of wildlife. Millions of jack pines have been planted on over 150,000 acres of state and federal lands under a management program aimed at providing habitat for warblers and timber on a 40 or 50 year rotation. But until the effort along the AuSable, no private property was managed for Kirtland's warblers. Foundation staff, working with Trout Unlimited's Michigan Property Management Board, proposed the project which involved clear-cutting an over-mature jack pine stand, then planting 2-year-old pines 1,100 to an acre. The trees were not planted in rows or randomly, but in wavy, parallel bands to form figure eights. This pattern mimics how jack pines grow after a wildfire. Trout Unlimited used the profits from the timber sales for the project fund, and the Foundation provided additional funds and technical assistance. The US Fish and Wildlife Service and Detroit Edison also helped pay for the program. The Michigan Department of Natural Resources contributed technical assistance and may install cowbird traps on the property. 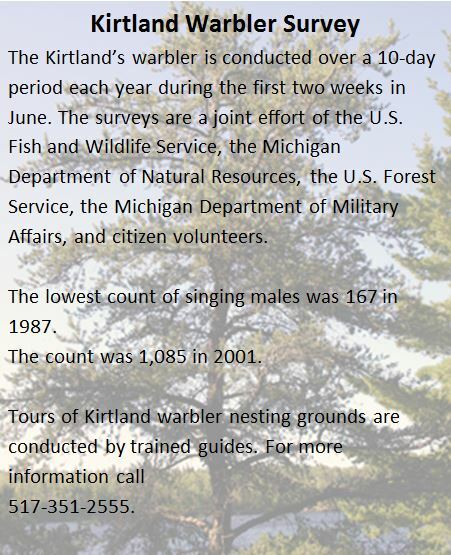 "We are very pleased that Kirtland's warblers have occupied the Trout Unlimited property," said Mike DeCapita, Michigan Endangered Species Coordinator for the US Fish and Wildlife Service. "The Fish and Wildlife Service contributed $9,000 to the reforestation of the property specifically to benefit the Kirtland's warbler." Trout Unlimited is dedicated to the conservation of coldwater fish and their habitats. But the non-profit organization took advantage of a rare opportunity to help a rare bird. Hopefully, more private acres will be managed for unique species and their habitats in the years ahead.